Life Worth Leading is a 501(c)(3) nonprofit organization, and SCUBA helps us fulfill our mission to provide education and resources to people with disabilities. We have a very flexible schedule that can accommodate your needs. Just contact us and we will be happy to arrange a private class or a small group class. The cost difference is just $300, and either way, you will get lots of one-on-one attention to ensure that you master your skills and leave the course as a certified diver who is safe and enjoys the experience! No matter how much additional time it takes, we will never charge extra to spend additional training and practice time with our students. We also won't certify students until they are ready to be safe, happy divers! 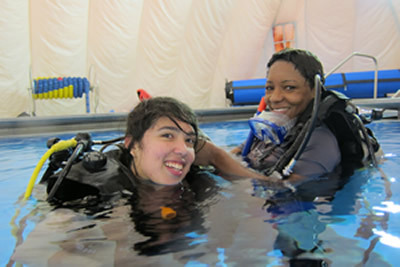 Take SCUBA Diving Classes with a group or private classes! Group classes are usually 4-6 people, so you will get lots of one-on-one attention. If you have a hectic schedule, a private SCUBA class may be a better option.